This vintage lace nursery design was one of my favorite spaces to work on, not only because the mommy-to-be happens to be my right (and left) hand here at Caden Lane and has been part of the team for almost nine years, but also because I consider Amy to be family. So in a way, I’m pretty sure baby Scarlett is mine. And I CANNOT WAIT to get my newborn fix when she arrives in February. It’s a little ironic that we are around nursery design and trends all day (we LIVE and breathe these things), so you’d think we would know EXACTLY what we’d want in our own homes when it came to creating a space for baby. Wrong. When you see certain design elements (like chevron, monograms over the crib and the color coral) every day, they become very repetitive. But there are some design trends that we still love, like the color combination of coral, mint and gold. So it was a fun challenge to come up with a new twist on the popular color palette, and I’m pretty sure we nailed it! My rule for wall decor is usually to “go big or go home.” That could also just be a Texas thing, but heck—it seems to work in nursery design too! I’ve been obsessed with these metallic wood angel wings since I first saw them—they are the perfect size for over the crib (securely attached to studs, of course) or in the glider nook, which is where we decided to hang them. They’re the perfect little reminder of the perfect little angel that will be occupying this room in the spring! Personalizing the walls is still in my top three list too, and we wanted to freshen up the wood monogram trend by choosing a sweet and simple font covered in gold glitter for baby’s name. Because always: GOLD GLITTER. I love how the name is paired with the perfect banner created from fabrics and ribbon that coordinate with the crib bedding (a very simple DIY coming soon). And that perfectly framed gold crib? Yup, it’s a cost-effective DIY too! I love when you can take what’s old and make it new again! To save a little money, Amy used a tall nightstand and small dresser from her parent’s home that we pushed together to make the perfect changing station. She did the most amazing DIY gold lace effect on the drawer fronts using a little spray paint and a piece of lace, and she painted the hardware gold to match. It’s the perfect combination for this vintage lace inspired nursery. And where did all this fabulous inspiration come from? Caden Lane’s baby bedding, of course! The mommy-to-be mixed and matched some of her favorite pieces from our bedding collection, including our brand new vintage lace ruffle crib skirt in white and the coral and gold sparkle crib sheet and crib bumpers. 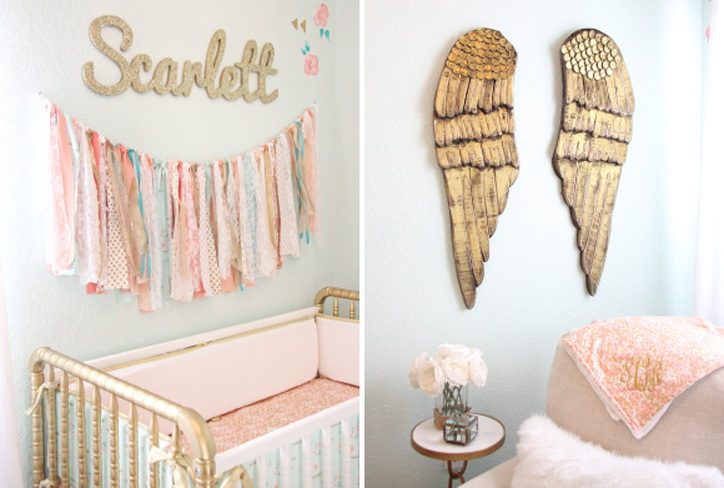 You can get all the details on Scarlett’s Vintage Inspired Nursery in our project gallery, including that perfect paint color, where to buy that gorgeous crib set, those gold angel wings, and more! Beautiful!!! What paint color is on the walls? I would like to know the same. Paint color on the walls? It’s exactly the color I am looking for! When will the coral and hold changing pad covers and crib sheets ship? I placed an order and was only told March 2016. Anything more specific? Hi Ashley, Are you referring to a purchase you made with Caden Lane? If so, you’ll have to contact their shop directly. Good luck with your nursery design! Where is the little side table from? Great look! I am sharing this on Pinterest. What kind of spray paint did you use as your accent on the crib, drawers and medallion for chandelier? Where are the flowers from? Are the decals or painted? Where did you get the name Scarlett? This is a beautiful pic that inspires me to put the name and ribbon banner above my daughters crib. HUGE MISTAKE. DO NOT PUT THIS ABOVE THE CRIB. Somehow, the ribbon banner came loose or was pulled into the crib while my daughter slept. By the grace of god I woke up and felt the need to check on her. The string had wrapped around her neck and arms and was tightening as she wiggled in her sleep. Had I not woke when I did I fear she would not be here today. Do not use this trendy design above a crib!